IPGCL (Indraprastha Power Generation Company Ltd) is india's power generation company in the state of Delhi. 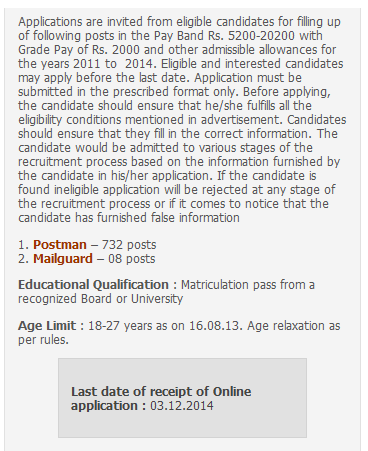 Notification has been published for the 06 post of DGM (HR),DGM (Finance),Manager (Finance). The candidates needs to apply to this recruitment before the Last date for applying is 15/02/2015. No. of Posts : 04 Posts. Method of Selection : On the basis of candidates interviewed / test performance. How to Pay Examination Fee : Fees can be paid through Demand Draft drawn in a favor of “Pragati Power Corporation Limited” payable at New Delhi. How to Apply : Candidate should apply online for this job through the official website http://ipgcl-ppcl.gov.in/employment_home.htm read the advertisement carefully and fill out the application forms before 15/02/2015. Candidate should fill the form giving all the necessary details required in the form and send it to “General Manager (HR), IPGCL/PPCL, Old Vigilance Bank, Rajghat Power House Complex, Rajghat-New Delhi-110002 ” So as to reach on or before 15/02/2015.